Thanks for stopping by to check out my project today. I'm having some technical issues with my photos of the project, so I hope you can view it while I work to get this resolved. 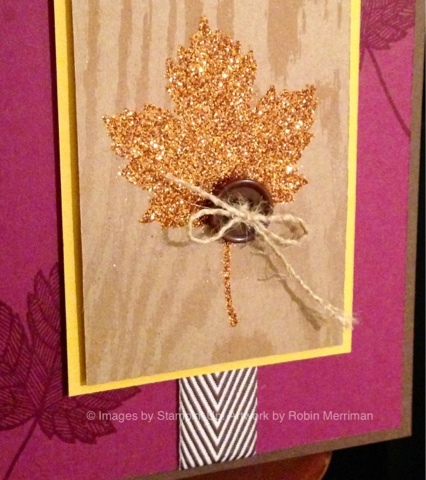 I've used the Magnificent Maple stamp for my card, love this stamp! My colors are Chocolate Chip, Rich Razzleberry, Crushed Curry and a piece of the Specialty Designer Series Paper - Naturals Composition. 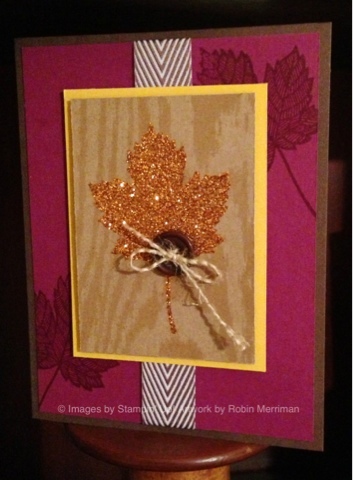 I stamped my leaf image with Versamark ink, then embossed it with Heat and Stick Powder. I was then able to add some Orange Glitter from the Holiday Catalog. It was reheated to make the glitter adhere well. I added a Naturals Button tied with a piece of Burlap that was frayed from our Burlap Ribbon. The accent ribbon is a piece of Chocolate Chip Chevron ribbon. I hope you liked my project, now just click the Blog Tour Icon below to visit the next stop!